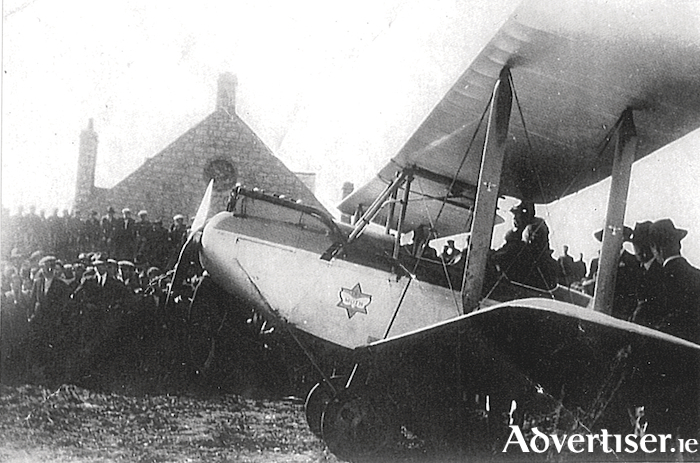 She toured Ireland in the summer of 1928 flying her Avro Avian biplane. She left Ballybunion at midday on September 1 (90 years ago on Saturday ) with a friend, Mr JS Shepherd of Rathangan, a serving RAF pilot, to fly to Galway. As they passed over Lahinch, the waters of the Atlantic looked so inviting that she decided to land on the beach nearby where she and her passenger had a swim before taking off for Galway again. She had intended to land at Carnmore, but while circling Galway, she spotted South Park and decided it would be a good place to land. This she did perfectly at 2.45pm. She actually thought she had landed on Galway Golf Club. She later said that South Park, with a little work, would make an excellent aerodrome and that the nearby waters of Galway Bay would be an ideal landing site for seaplanes which could moor at the docks. Her arrival brought a large crowd of onlookers to see her aircraft and the gardaí became concerned about the security of the plane, so they asked her to fly to Oranmore, which she did at 4pm. She brought Billy Naughton from Shop Street along as a passenger. She had to abort her first attempt at landing there because of sheep running across the runway but eventually she landed safely. The following day she flew to Renvyle to meet her husband, and Oliver St John Gogarty who owned Renvyle House Hotel. The remoteness of Renvyle from Dublin prompted Gogarty to investigate the possibility of an air link to Dublin, so while she was there, she surveyed potential landing places. Unfortunately, she became stuck in the sand when she attempted to land at Tullaghbawn Strand, and the plane had to be freed and moved to safer ground. Our photograph today, which we show you courtesy of Eleanor Margetts, shows Lady Heath in her biplane, presumably just before she took off from South Park. You can see some of the large crowd of onlookers and the Claddagh Hall in the background.